Pitcher Jim Strickland hasn’t been on the mound for more than 35 years. There’s still time to cheer for him. Someone who sees what they gained, instead of what they may have lost? That’s worth a standing ovation. 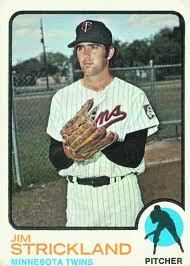 I remember adding that Twins Rookie Stars card to my 1972 Topps set, seeing him with Rick Dempsey and Vic Albury. How did the card make him feel? How did Strickland fare versus the Angels? Thanks to http://www.retrosheet.org/, you can see for yourself! I thanked Strickland for his military service. He thanked me for being ME. “Tom, Thank You for being such a fan. Thank you for the questions. God bless you.